Last year was the year of Samsung and it’s a series, the A3, A5, and A7 all performing well. And now, with the release of A8 and A8+ it’s really shaking things up. With the A series, Samsung has set its sights on dominating the Mid-Range Smartphone market. The Galaxy A8+ continues with the long stylish tradition of Samsung’s glass and metal looks. The back of the Phone looks amazing in that glossy design, but remember to wipe clean frequently. The design is premium looking and very solid, and sturdy. For this model, Samsung has placed the fingerprint sensor under the camera. It also enjoys an IP68 water and dust resistance. It features a standard Headphone Jack and a USB-C port. 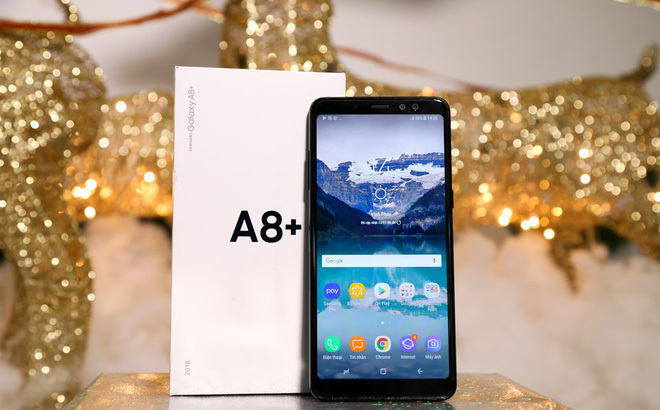 The Galaxy A8+ comes with Samsung Experience, which is nothing more than a smoother more advanced version of the TouchWiz that Samsung has refined over the years, creating a minimalistic UI looking very polished. Overall, you may not experience any lags while multitasking, but this software does make the Phone slower, but you can always turn off all the animations in the Developer Settings. The Galaxy A8+ may have been targeted as a “mid-range” smartphone, but it comes with the full support of Samsung apps like Game Launcher, Samsung Pay, and Samsung’s own artificial intelligence, the mighty Bixby, it supports also Dual-Messenger, allowing you to clone apps like WhatsApp and be able to use multiple accounts on one device. The Galaxy A8+ also allows you to pick and choose which original Samsung apps you want to install when you are first setting up your phone. The Galaxy A8+ is powered by the Exynos 7885 OCTA paired with two Cortex A73 and six A53 performance core, 4GB RAM, and 64GB Storage. The battery life is between 12-14 hours with each charge, getting you through the entire day, depending on your settings of course and how much you’re chatting, snapping, twitting, and whatsapping (is that even a word? moving on!). Although the A8+ does come with a glassy back, it does not support wireless charging, the reason behind this decision by Samsung is to maintain certain unique features on their most high-end devices. The phone comes with a rear camera with 16MP and it bears the record of being Samsung’s first smartphone to feature dual-cameras on the front with a combination of 16MP and 8MP. A true wonder made by the Japanese technology giant that has not disappointed fans and buyers.